A frontier town sheriff leads an unlikely search party to rescue the prisoners of cave-dwelling cannibals. After killing and robbing travelers at a campsite, bandits Buddy and Purvis unknowingly flee into territory occupied by a cave-dwelling tribe of savage cannibals. Buddy is killed while Purvis escapes. Eleven days later in the frontier town of Bright Hope, grizzled back-up deputy Chicory alerts Sheriff Franklin Hunt to a suspicious drifter, Purvis, spied burying luggage in the ground before retreating to The Learned Goat saloon. Hunt confronts Purvis, who claims his name is Buddy, and shoots him in the leg when he attempts to run. Purvis is taken to the jail. With Doc Cooper drunk, gentleman gunslinger John Brooder asks Samantha O’Dwyer to tend to Purvis’ wounds. Samantha agrees, leaving her husband Arthur home alone with an injured leg. Sheriff Hunt tasks his deputy Nick to stay with Samantha while she treats Purvis. Chicory returns to his home while Hunt informs Arthur that his wife will have to spend the night at the jail. Clarence the bartender rouses Sheriff Hunt in the morning after finding stable boy Buford gruesomely killed and five horses stolen. Clarence also notifies him that the jail is empty. Hunt and Chicory rush to the scene to find Samantha, Nick, and Purvis missing, and a strange bone arrow jutting from a post. Townspeople gather at the saloon. Examining the arrow, Bright Hope’s resident professor identifies it as belonging to a savage subset of Native Americans known for being cannibalistic troglodytes. Despite the warnings, Hunt vows to ride out in search of the kidnapped trio with Arthur, even though the cowboy requires a crutch. Chicory insists on accompanying the search party as does Brooder, who holds himself accountable as the person who fetched Mrs. O’Dwyer to tend to the drifter. The four men set out on horseback for a several-day journey. Two Mexican bandits encroach on the search party’s campsite one night. Hunt prepares to interrogate them, but Brooder shoots both bandits dead. The men move their campsite and end up ambushed while sleeping. Brooder is stabbed in his shoulder and all of the horses are stolen. Brooder’s horse is injured while resisting, forcing Brooder to euthanize the animal. The men continue their trek on foot, with Arthur’s leg forcing him to fall behind and make up lost time with less sleep. A confrontation between Arthur and Brooder ends with Arthur completely breaking his leg. Hunt suggests amputating to avoid gangrene, but Arthur insists on simply resetting the bone, which Chicory does for him. Hunt, Chicory, and Brooder are forced to leave Arthur behind, but they continue dropping rocks as markers so that Arthur can pick up their trail. Hunt, Chicory, and Brooder are ambushed when they make it to the valley with the cannibal cave. Brooder is severely wounded and dies a short time later while shooting an attacking cannibal. Hunt and Chicory are captured. Hunt and Chicory are imprisoned in the cave in a makeshift cell opposite Samantha and Nick. Samantha informs the men that Purvis was killed and eaten. Nick is pulled from his cell and brutally butchered while the others watch helplessly. Later, Hunt and Chicory trick several cannibals into killing themselves by unknowingly overdosing on opium from a hip flask. Arthur determinedly follows the trail and eventually makes it to the valley. Arthur kills several cannibals and rips out a fashioned bone embedded in one cannibal’s throat. Now able to simulate the guttural sounds used by the tribe to communicate, Arthur summons and kills several more attackers on his way up to the cave. Realizing what Hunt did with the opium, the cannibals drag the sheriff from his cell and begin torturing him. Hunt is shot, but he manages to decapitate an assailant as Arthur makes it to the cave to kill the captors and free the others. Mortally wounded, Hunt realizes he must remain in the cave to die, but tells Arthur he will try to kill the remaining three cannibals if he can. Arthur, Chicory, and Samantha escape the cave. As they trek out of the valley, the trio hears three gunshots echoing behind them. Bright Hope is modestly atypical for a silver screen vision of the Wild West. The frontier town sees its share of the usual drunkards, bandits, and snooty society types, of course. But it is also a place where cowboys romance their wives instead of brothel whores and civilized lifestyles have an edge over lawlessness. Modernization moves less quickly in the outlands. In a skull-decorated canyon from a Stephen King fever dream lurks a tribe of troglodytes so steeped in savagery that they eat human flesh, and mutilate their own to communicate through prehistoric, guttural howls. When these raiding man-beasts tiptoe into town to capture a drifter, a deputy, and one man’s wife, four unlikely companions form a misfit search party intent on a daring rescue, despite knowing everyone might not return. 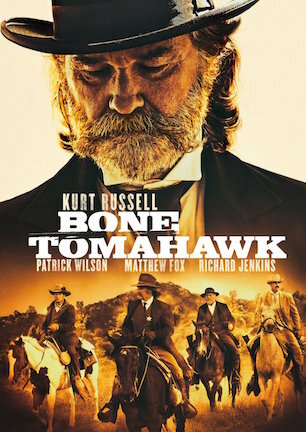 Marketing material for the movie, or perhaps just popular public presumption, gives the appearance of “Bone Tomahawk” being a Kurt Russell vehicle. Not quite. Russell may play the angry lawman leader of an underequipped foursome gearing for a fierce faceoff with feral natives, but “Bone Tomahawk” features an even-keeled ensemble of almost embarrassing riches from the first character to the last. Russell has long been at a career point where commenting on his abilities provides no purpose. Should he ever choose to cruise on autopilot, Russell can always coast on bottomless screen presence. That’s why even with his thick-mustached sheriff barking commands through authority both quiet and loud, it is easy to miss how subtly overshadowed his particular persona can be. The character is no less essential, neither is Russell, although compared to the other three men in his posse, Russell’s Sheriff Hunt is at least the most archetypal. Patrick Wilson puts such energy behind an injured cowboy’s unwavering determination that backing his crippled heroism comes easy. Matthew Fox is intentionally more understated as a gentleman gunslinger both dapper and dangerous, which makes a terrific negative to Wilson’s positive in their bickering battery. If anyone is to be singled out amongst the foursome, it is Richard Jenkins, delivering an award-caliber performance as a brilliant Barney Fife who is either an incredibly intelligent idiot or a shockingly dimwitted genius. His characterization of back-up deputy Chicory is exemplary synergy of acting and scripting. It’s impossible to tell how much comes from the page and how much comes from the performance, although the same can be said of everyone in the cast. Each link requires the other, and each link is critical in keeping the chain unbreakable. Writer/director S. Craig Zahler’s screenplay is relentlessly layered in language and nuance. Snappy dialogue is reminiscent of the best exchanges from “Deadwood.” Criticisms can be made regarding necessity for the film’s length, though Zahler never misses even the most mundane moment to evolve his story and to keep each individual flourishing equally within the group. Subtle swaths of character development exist everywhere. When Wilson rushes from his house in a huff at the news of his wife’s disappearance, the camera lingers behind. Russell saunters with a shoulder slump to close the front door and grab Wilson’s shoes. “Bone Tomahawk” comes across as slow at times, but Zahler is deliberately taking time to tell the audience something new about these men, even in these seemingly meaningless movements. Bright Hope’s saloon, The Learned Goat, features a sign behind the bar depicting a goat in glasses. A spyglass carried by Fox has its own name, “The German,” and the mere act of holding it signifies an advancement in the search party’s inner machinations. Nowhere in “Bone Tomahawk” is there a detail devoid of personality or importance. “Bone Tomahawk” has been described as a horror-western, which offers a somewhat inaccurate impression. There are elements of horror in the grisly depictions of gore during the final act. But replace cannibals with Apache, Mexican military, or six-shooting outlaws and the character-driven core of heroic western drama remains unchanged. Nevertheless, “Bone Tomahawk” is not for the weak-stomached or faint-hearted. One devastating moment in particular features a brutal slaughter searing so deep that it is not soon to fade from the mind’s eye. The likely place for interest to wane is in the over two-hours runtime. Arguably, the movie doesn’t require all of the space it takes and antsy viewers will be anxious to say, “get on with it.” Yet what makes the occasionally slowed tempo so tolerable is the knowledge that “Bone Tomahawk” is unlikely to stay in any current lull for long. The film feels like a horseback journey of furious galloping requiring regular fireside stops to catch breath, nap, and refuel with a plate of pork and beans. Because the characters are so unpredictable and enjoyable, it is never a chore to sit with them a spell, either. Even with an accordion rhythm expanding and contracting, “Bone Tomahawk” is always entertaining and still captivating when quiet. Overflowing with character in its cast, setting, scripting, and tone, “Bone Tomahawk” easily earns its place as one of the 21st century’s most memorable modern westerns. October 12, 2015 by Ian Sedensky.